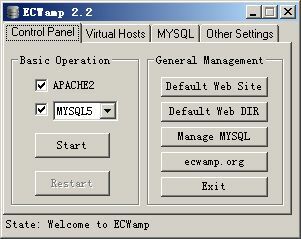 ECWamp is a free software has a graphical interface to quickly build Apache web server environment. All you need to download and unzip ECWamp will be able to complete the installation, if you feel no longer need ECWamp, you can just delete. its directory to complete the uninstall. ECWamp is an easy to install Apache distribution containing MySQL, PHP. ...... Easy to select and start the server, web application and database management, and new created virtual host, and through friendly automatic and manual mode to set the relevant properties and security maintenance, optimizing the database, port management and other service settings. ECWamp most salient feature is its excellent mobility, you can put it on any one disk, directory or even mobile hard disk and so on, still using. Sends Short Messages (SMS) using WEB Servers directly from the user's PC. Qweas is providing links to ECWamp 2.2 as a courtesy, and makes no representations regarding ECWamp or any other applications or any information related thereto. Any questions, complaints or claims regarding this application ECWamp 2.2 must be directed to the appropriate software vendor. You may click the publisher link of ECWamp on the top of this page to get more details about the vendor.